Little Sebago Lake, as well as Big Sebago, have historically used the measurement “feet above mean low tide Portland harbor” to state our water level. The standard dates back to the days when S.D. Warren owned the lake and used a series of dams to control the flow of ice and logs to the Presumpscot, and out to the harbor. The “Warren Standard”, for lack of a better name, was cited in the 1984 DEP agreement with the Little Sebago Lake Association as the measurement standard for maintaining the summer and winter level of Little Sebago Lake. The agreement document states that Little Sebago Lake will be maintained at 289.2 feet above mean low tide Portland harbor from April 15 through October 15, and lowered for the winter October 15 thru April 15th to a winter level of 18″ to 21″ lower. We hit -18″ about a third of the time but a Winter level of -15″ is the norm. The lake will drop 8″ to 12″ by Thanksgiving and 12″ to 15″ by New Years. The basic idea behind lowering the lake is keep the frozen lake from damaging the shoreline with an added benefit of increasing flush rate. It also helps to minimize flooding concerns in the spring when experiencing excess snow melt combined with heavy rains. The Warren Standard is not the same measurement used by the US Geological Society. That measurement uses as its basis “feet above sea level”. The two standards have a difference of 3.48 feet. 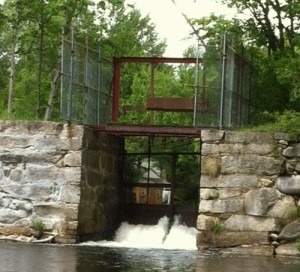 The Collins Pond Dam is the first working dam downstream from Little Sebago Lake. This photo was taken during the 2012 spring flood when Little Sebago Lake was 15″ above summer level. Please note the water going over the top of the dam, this is why we need to be careful when releasing water from Little Sebago. How fast does the lake level lower to its winter level once the dam has opened? When the dam is opened on October 15th, with no rain the lake will go down about 1/2 inch per day. As the lake level decreases, the volume decreases too. Think of it as a full bucket of water that you tilted 45 degrees. The initial flow is the largest, steadily decreasing as the bucket (lake) empties. By Thanksgiving that 1/2″ per day will be closer to 1/2″ per week, by Christmas the lake will be close to the target level of -18″. Remember that it is Mother Nature who decides when and where we will be, not the dam keeper. Why is October 15th the date the lake starts to be drawn down? On several occasions the question of delaying the winter dam opening from October 15th until November 15th has been brought up. Currently the water level of Little Sebago is controlled by the Maine Department of Environment Protection via the 1984 water level agreement with the Little Sebago Lake Association. That agreement specifically stated the dam will be opened on October 15th to begin the winter draw down and will be closed on April 15th to begin bringing the lake back to a summer level of 289.2 (feet above mean low tide at Portland Harbor). There are many reasons for keeping the current schedule, but I will limit my thoughts to the most important: Spring snow melt and April showers. Getting the water level down 15 to 18 inches by the first of the year is critical. The 1984 DEP agreement allows us to get to -20 inches but in my 32 years as dam keeper we have never reached that level. It is critical for just one reason, to give us room to accommodate the spring snow melt and the spring rain. I have always used the rule of thumb that one inch of rain adds two inches to the lake level. Let me expand that to say once the ground is frozen, and there is no absorption, that rule climbs to a ratio of closer to 3 or 4 inches of added water level per inch of rain. Consider that there is over 40 square miles of watershed that drains directly into Little Sebago Lake. The most recent example of why we need to keep the traditional water level schedule is the past spring of 2017. We received a near record snowfall this past winter as well as heavy spring rain. An October 15th opening allowed us to get the lake down 15 inches through the winter and the ability to absorb most of the spring rain and snow melt. By April 15th the lake was only +3 inches, a manageable level even though it took well into May to drain it off. Opening on November 15th would have meant at least another 5 inches of water added to the 3 or a total of 8 inches. Eight inches over summer high starts a number of lake issues from flooding leach fields to disturbing loon nests. Ultimately the job of dam keeper on Little Sebago Lake is simply transferring water from the lake to the Atlantic as quickly and efficiently as possible. The window to accomplish that is October to April. Shortening that window makes no sense.